There are several corridors of Trans-European Road Network across Bulgaria. One of them is corridor no. IV that secures north-west connection of Bulgaria to Aegean Sea in part of Sofia – Kulata – Thessaloniki. Name of the corridor in this part of Sofia – Kulata is “Motorway Struma” there is a river flowing in parallel to motorway with the same name. Motorway is divided into four sections: Lot 1 to 4. As Lots 1, 2 and 4 are in operation or under construction Lot 3 is the most challenging Lot because it is only in design phase. Investors of the sections mentioned is Bulgarian National Company for Strategic Infrastructure projects (NCSIP). 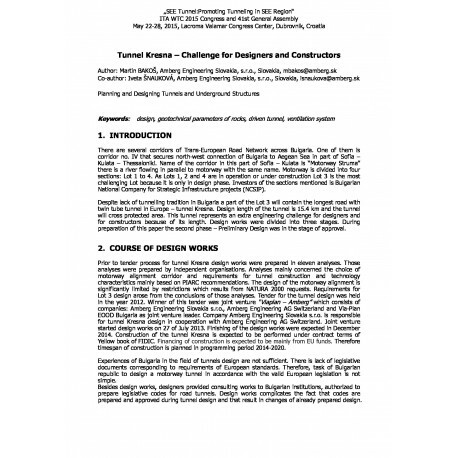 Abstract: There are several corridors of Trans-European Road Network across Bulgaria. One of them is corridor no. IV that secures north-west connection of Bulgaria to Aegean Sea in part of Sofia – Kulata – Thessaloniki. Name of the corridor in this part of Sofia – Kulata is “Motorway Struma” there is a river flowing in parallel to motorway with the same name. Motorway is divided into four sections: Lot 1 to 4. As Lots 1, 2 and 4 are in operation or under construction Lot 3 is the most challenging Lot because it is only in design phase. Investors of the sections mentioned is Bulgarian National Company for Strategic Infrastructure projects (NCSIP).